Informtainment.com by ORLANDO: Bing & Google sign Twitter deal!! 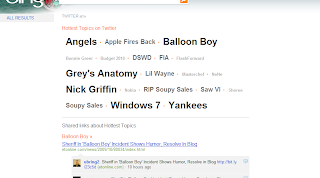 Bing & Google sign Twitter deal!! With the real time traffic, blogs will have a small window to gain a loyal following in their Caribbean category. The key to this will remain the same. Thoughtful but consistent blogging and content update (not spam). Most traditional media is behind the ball on twitter. They are trying to catch up. The more you provide great information and content, the better it will be to utilize this new deal between Bing and Google. Techcrunch reported: Google may take a few months to get started. Bing is available now here. #Dancehall, #Soca, #Caribbean, always twitter with your intended category as "#". This will give you dominance as persons search for these terms on Bing and Google. The influx of smartphones will give rise to a variety of new twitter users. While some of the information they will be discussing can be useless, other information these smartphones users tweet will be valuable to brand owners. What are they interested in, who are they interested in, what is a celebrity doing right now. 4. I never wanted them to see that. Online media is watching, if you are a celebrity, you still have to be careful what you twitpic, it can be carefully crafted to provide updates on your music and be a source of information for media companies like mines. The flip side is, not only your friends are seeing the twitpic. Keep it business, we like that because it feeds our updates.